Addressing the participants of the annual gathering of the Central Committee of the Communion of Churches in Indonesia (PGI), the General Secretary of the Christian Conference of Asia (CCA), Dr. Mathews George Chunakara said that Indonesian Churches had demonstrated their profound commitment to strengthen wider ecumenism in several significant ways. The Central Committee meeting being held from 28 to 31 January 2019 at Bogor is attended by about 250 representatives of PGI’s 89 member churches, including 125 Central Committee members, Commission members, special invitees and fraternal delegates. “In a situation of an increasing trend of social divide, communal hatred and political polarisation create serious threats to peaceful co-existence of people and communities; the efforts made by the churches in Indonesia to nurture communal harmony through inter-religious collaboration became a model for other Asian churches”, stated CCA General Secretary. The CCA General Secretary applauded the solidarity and support of Indonesian churches to the Asian ecumenical movement through CCA during the past several decades with their active participation and significant contributions in various ways including sharing of financial and human resources. 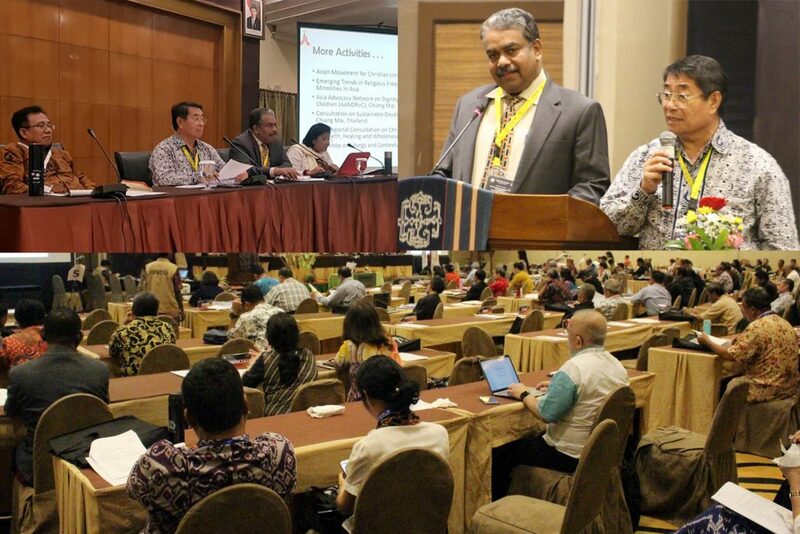 A special meeting of CCA member churches in Indonesia and the member council, the PGI, held on the second day of the PGI Central Committee was attended by representatives of 29 churches out of a total of 31 member churches of CCA in the country. Ecumenical responses to migration and trafficking in persons, especially the situation of Indonesian female domestic workers stationed in neighbouring countries and in the Arabian Gulf, militarisation and human rights violations in West Papua, ecumenical formation and leadership development, and religious intolerance were the issues discussed at the meeting of CCA member churches. The church leaders expressed concern over the increasing number of Indonesian domestic migrant workers persecuted, tortured and killed overseas during their employment. The church leaders quoted incidents of more than 120 female Indonesian domestic workers deaths in 2018 during their employment abroad; the dead bodies had been transported to Indonesia. The need for churches engagements in advocacy together with civil society organisations and churches in migrant worker receiving countries as well as at the inter-governmental level, especially through the UN to protect the rights of the domestic workers, was emphasised during the discussions. The CCA General Secretary shared information about the strategic programme plan as well as the programmes and major events of CCA in 2019 such as the Congress of Asian Theologians (CATS), Asian Ecumenical Women’s Assembly (AEWA), Asian Ecumenical Institute (AEI), Young Ambassadors of Peace in Asia (YAPA), Asian Inter-religious Leaders’ Summit on Building Peace, CCA-WCC International Consultation on Stateless and Trafficked People, Observance of the Asia Sunday-2019 on the theme ‘ Stateless and Trafficked People: Our Co-Pilgrims’. The meeting of Indonesian member churches of CCA was facilitated by CCA Moderator Archbishop Willem T.P Simermata, the General Chairperson of the PGI Rev. Dr. Henriette Hutabarat Lebang, and the General Secretary of the PGI Rev. Gomar Gultam.